Chinese photographers said the South China tiger on digital pictures, released by forestry authorities and widely discussed on the Internet, is a fake. A preparatory digital picture appraisal center under the China Photographers Society, released the results on Sunday after a team of photographic experts assessed the 40 digital pictures provided by NetEase, a Chinese Internet company. The center said technological analysis from last Tuesday through Sunday showed the South China tiger on the 40 pictures was not real and could not serve as evidence for the existence of the wild animal. The pictures must have been taken by people with photographic experience or under guidance and could not be done independently by a person without any photographic experience, claimed experts. 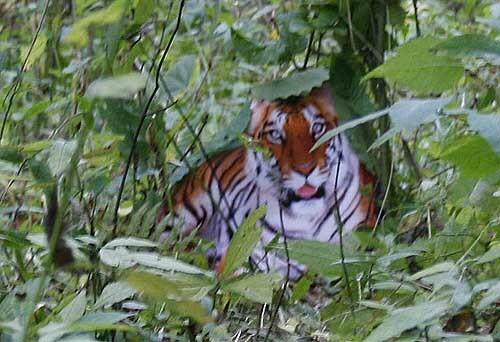 The digital picture, purporting to be a wild South China tiger crouching in the midst of green bushes, was released by the Forestry Department of northwest China's Shaanxi Province at a news conference on October12. Zhou Zhenglong, 52, a farmer and former hunter in Chengguan Township of Shaanxi's Zhenping County, photographed the tiger with a digital camera and on film on the afternoon of October 3, a department spokesman said. The Shaanxi forestry department said it had confirmed the 40 digital pictures and 31 film photographs were genuine. But the pictures released were not the original ones and they underwent modifications, such as time and signal, according to experts. Bao Kun, an expert who participated in the appraisal by the center, told Xinhua they announced the results out of "a citizen's sense of social responsibility." A detailed report concerning the appraisal would be announced in about a week, Bao added. In response to the appraisal results, the Shaanxi provincial forestry department said in a written statement to media that they had already "showed their attitude toward the South China tiger issue and would continue to pay attention to the matter. "We thank netizens and media for your care of the South China tiger and of the wildlife protection cause," the statement said, offering no direct comment on the appraisal results." In a statement on November 23 the department said: "We firmly believe this basic fact: That wild South China tigers exist in Zhenping county of Shaanxi Province." The South China tiger, from which other sub-species such as the Siberian tiger evolved, is listed as one of the world's ten most endangered animals. It is the only tiger subspecies native to China's central and southern areas. In the early 1950s, its population was 4,000 across the country. Since 1964, no sightings of wild tigers have been reported in Shaanxi. Its former habitats were in Guangdong Province, Guangxi Zhuang Autonomous Region and the central provinces of Hunan and Jiangxi.